I like to call this look a 3 in 1. It incorporates bantu knot-out curls, twist-out curls and pin curls. It's a simple and sophisticated up 'do style that would be difficult for anyone (or any day) to destroy. If you know how to style a bun, you can create this look. I like to call this a 3 in 1. 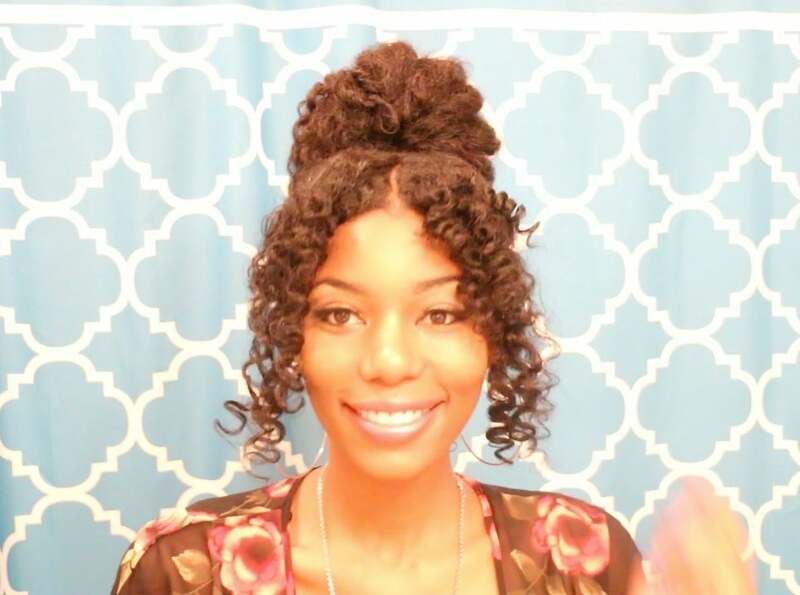 This look incorporates bantu knot-out curls, twist-out curls and pin curls. It’s a super simple and super sophisticated up ‘do style that would be difficult for anyone to ruin. First, divide your hair to create a bang that’s 3 inches long and three inches wide. Clip that hair to keep it separated. Next, create a high ponytail as if you were going to create a bun. Grab your favorite leave-in conditioner/styling product and apply it to your ponytail. Then make seven or eight medium-sized twists. Afterwards, roll each twist separately making a pin curl and bobby pin it into place. Your entire ponytail should be twisted, pin curls. Then take the hair in the front and make a part directly down the center. Using your leave-in conditioner/styling product and sealant, make about three bantu knots on each side of the part. You don’t want to make them too small because your curls will be too tight when you unravel them. Wrap your edges with a scarf. Cover your bantu knots as well to ensure your entire hairline will be smoothed overnight. You can use gel on your edges for a sleek look. Finally, allow your hair to dry over night. In the morning, remove the scarf and take down the bantu knots in the front. Add a little oil for shine. Then unravel the twisted, pin curls in your ponytail. Gently break them apart to create volume and twist the ponytail into a loose, curly bun. The end result is a romantic up ‘do fit for the sophisticated natural or for the lady who wants to look put together for the day. Not only is this a beautiful look but it also serves as a great protective style. Try it out. I would love to hear what you guys think below!